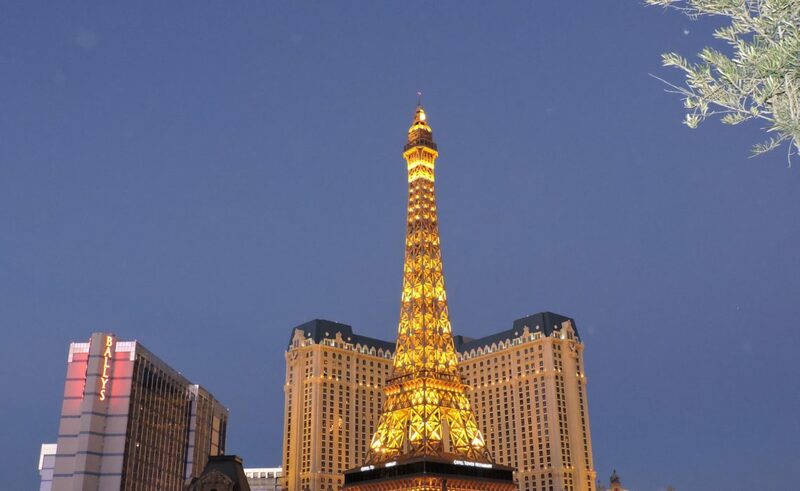 What drives people from all around the world to Las Vegas? I was asking myself this question for a long time. Surprisingly, despite my adventurous nature and longing for exploring, I never had a burning desire to visit the gambling capital of the world. The fact that I live about 4 hours away from Las Vegas makes it even worse. So I can say that I am guilty of not exploring “my backyard”. After postponing this trip for years, I finally put aside all excuses and decided to visit the home of 15 largest hotels on the planet. And I am glad I did! Especially happy I was to explore 5 prettiest hotel lobbies in Las Vegas. I should admit, Las Vegas is quite an interesting city. The main point of the city is the Strip. This, a little bit over 4 miles long, stretch of Las Vegas Boulevard is worldwide know for the concentration of the hotels and casinos on its territory. If you are a gambler, you know that you are in a right place. The casinos are everywhere. Slots machines, table games… Your choices are unlimited! I am not a gambler and wasn’t impressed by all this “casino business”, but what really got my attention were the hotels themselves. To be precise, the hotel lobbies!.. They have been surely designed to wow their guests. Each lobby is unique in its own way. Some of them are traditionally elegant, some are glamorous, while others are so spectacular that you don’t even feel like you are in a hotel lobby. Without further ado, here is a list of my 5 favorite hotel lobbies in Las Vegas. This was the first hotel we explored. The lobby looked amazing. I literally couldn’t stop taking pictures. As soon as you walk into the hotel, you find yourself in a beautiful garden with trees covered in sparkling lights and decorated with shining balls. The trees are professionally lined up on both sides of a walkway to the grand hotel and casino. However, the spring theme of the hotel would not be complete without stunning carousel made of the flowers and mosaic tiles on the floor designed in the shapes of the flowers and butterflies. The second place on the list of the prettiest hotel lobbies in Las Vegas belongs to the Venetian. If you like Italy and especially Venetia, this is a place for you. At some point you even forget that you walk in a hotel lobby. It’s all thanks to the design of the hotel that was inspired by Italian Venice itself. No wonder, the guest and visitors of the hotel are completely captivated by beautiful architectural replicas of Venetian landmarks. The painted ceiling that looks like a real sky and the canal surrounded by shops and restaurants create atmosphere of an Italian street or shopping plaza. And of course, who can stay away from a gondola ride with a singing boatman? The first thing that comes to my mind when I think of the Bellagio Las Vegas are its famous musical fountains. Every thirty (fifteen in the evening) minutes there is a fountain show: the synchronized water and light show accompanied with music. Bellagio is also known for “Fiori Di Como”, the ceiling glass sculpture created by Dale Chihuly. This masterpiece that consists of 2,000 hand-blown glass blossoms attracts daily over 15,000 – 20,000 people to one of the prettiest hotel lobbies in Las Vegas. Just in front of the Bellagio is located another hotel that is worth mentioning here. 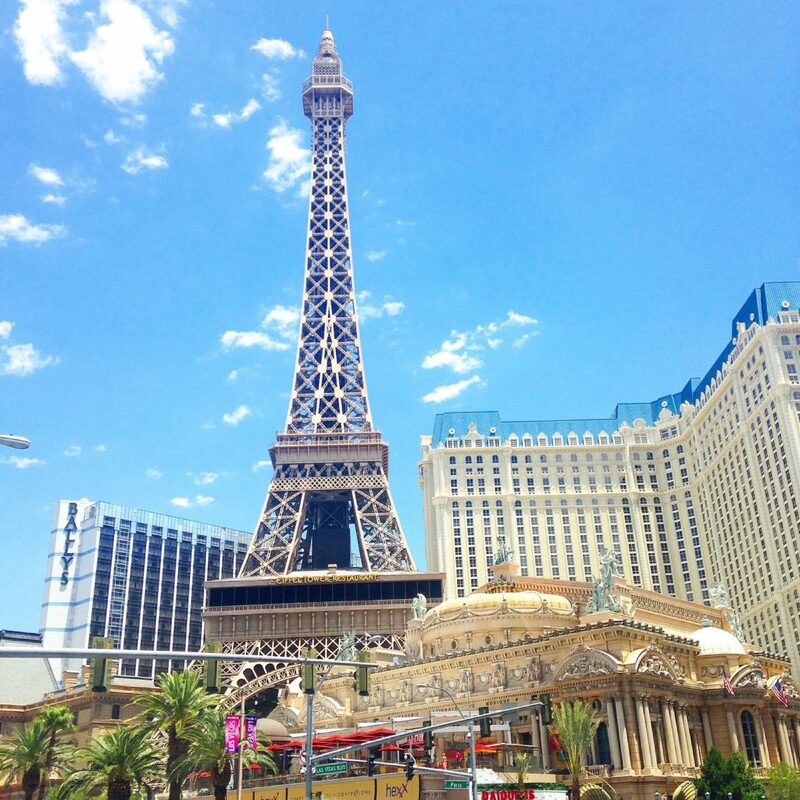 Paris Las Vegas, as its name suggests, was inspired by Paris the capital of France. The hotel with a half-size Eiffel Tower and a two-thirds size Arc De Triomphe, a replica of La Fontaine des Mers, effortlessly transports its guest and visitors to the beautiful streets of Paris with endless number of shops and restaurants. Take your time and stroll down these “streets” of another beautiful hotel lobby in Las Vegas. You won’t regret it! There are a few things that make the Palazzo stand out among numerous fabulous hotel lobbies in Las Vegas. First, the Palazzo, like the Venetian, takes its inspiration from exquisite Italy. Second, the lobbies of the Palazzo are decorated seasonally. 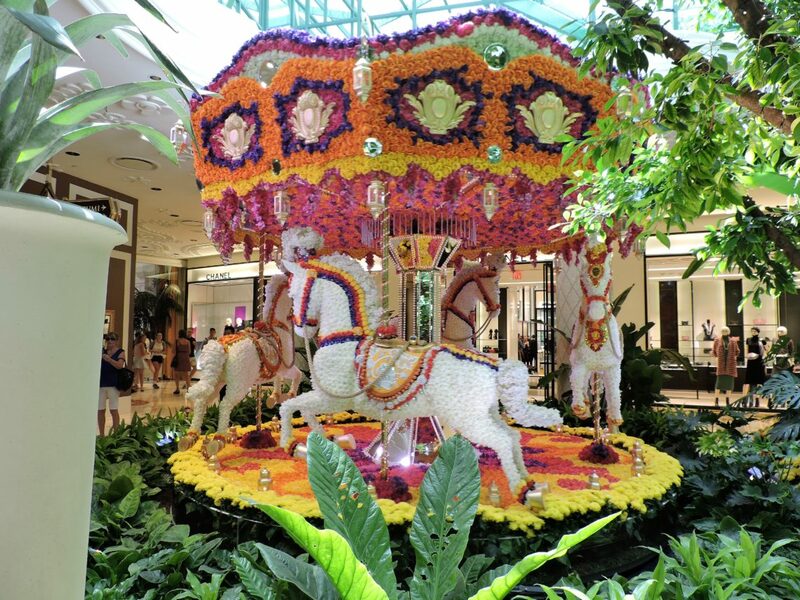 The mesmerizing floral installations change their colors in order to match current holidays or seasonal flower bloom. You will be also amazed by stunning displays in front of the Waterfall Atrium inspired by Venetian women and their lavish dresses. Wow, I’ve been to Las Vegas a while ago and I really wish I visited the Wynn Las Vegas! It is really worth visiting. Next time you are in Las Vegas, try to make it. You won’t regret it.